When the gods create a talking tree, they soon get fed up with it, because it won’t be quiet! So they turn it upside down and bury its head in the dirt! 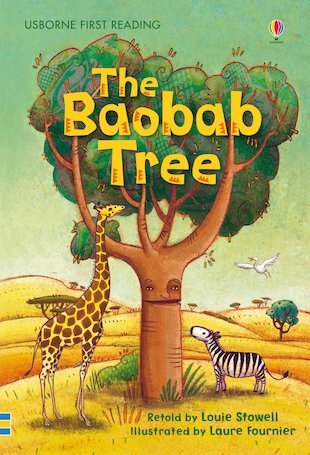 Based on the famous African folktale of the creation of the Baobab tree, this lovely little book tells a classic story in rich, vibrant artwork and carefully-levelled text. Presented in a hardback gift edition with a ribbon marker, the book supports Level Two of the Usborne First Reading series, for children who are starting to tackle more complex stories and sentences. It includes several pages of reading-related puzzles to build skills and comprehension.